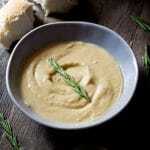 Creamy and comforting Tuscan chickpea soup. Made with only three ingredients, chickpeas, garlic and rosemary it's a hearty and filling traditional recipe with tons of flavour. Finely chop the garlic and add to a large pot with the rosemary and 1 tbsp of olive oil. Fry the garlic until it starts to take on colour but not browned. Add the chickpeas with their cooking liquid with a pinch of salt and pepper and bring to a boil. Turn down to a simmer and simmer gently for 5 minutes. Remove the sprigs of rosemary and set aside. Using a hand-held blender blitz the soup to a smooth consistency. Adjust the thickness by adding extra water to your liking (it should be thick but not as thick as a paste). Add extra seasoning if required, serve with crusty bread.